Dwayne Johnson and Zac Efron attempt to reboot classic nineties television series, Baywatch, for a contemporary audience. The result hopes to capture the spirit of the 21 Jump Street cinematic re-imagining, by putting an R-rated spin on a well known cultural property. Johnson and Efron are both excellent comic actors, but the material here is so sub-par that they are unlikely to be donning the red swim shorts again any time soon. Whilst the original Baywatch series was by no means critical perfection, it had a charm and camp that lends itself to a fond nostalgia - something that the reboot never quite delivers. Johnson stars as Mitch Buchannon, lifeguard at Emerald Bay beach who is saddled with new recruit Matt Brody (Efron), a former party-boy professional swimmer. To make matters worse, the owner of the new country club is using the beach as a location for illegal drug laundering. The team must unite through their differences to tackle this emerging drug kingpin. Damian Shannon and Mark Swift (Freddy vs. Jason, Friday the 13th) write the screenplay that fuses attempts at raucous R-rated humour with a crime-centred narrative - akin to Phil Lord and Chris Miller's hilarious 21 Jump Street reboot. Instead of the savvy and original blend of humour that Lord and Miller initiated with stars Jonah Hill and Channing Tatum, we have our new sparring duo in the form of Brody and Buchannon - with none of the jokes or awkward charisma that made the Jump Street pairing the runaway success it was. Johnson's faux-arrogant tough guy shtick feels entirely played out (have people not realised he's been giving the same performance for years now? ), whilst Efron's cocky young stud isn't provided with the material to create a character with any lasting impact beyond Efron's physicality. Shannon and Swift's narrative is driven by the contrived, half-baked crime angle, which would be tolerable if paired with some inventive, original R-rated material - but Baywatch barely raises a titter, even when trying to play its A-game. The blend of action and gags is smoothly directed by Seth Gordon (Horrible Bosses) who provides a slick, contemporary, albeit wholly unmemorable aesthetic style. The attempts at seriousness on a TV budget made the original Baywatch camp entertainment, but attempts at seriousness in a huge budget action picture are nowhere near as amusing. Bringing original stars back has now become an essential part of the contemporary reboot narrative (see Johnny Depp in 21 Jump Street), it's only natural that David Hasselhoff and Pamela Anderson make cameos. Whilst these aren't the most inventive of appearances - it does provide some of the warm nostalgia that the rest of this glossy picture lacks. Hasselhoff's appearance (complete with original theme) is mildly amusing, whilst Anderson's mute cameo is likely to lend itself better to a sequel - but don't hold your breath for that. 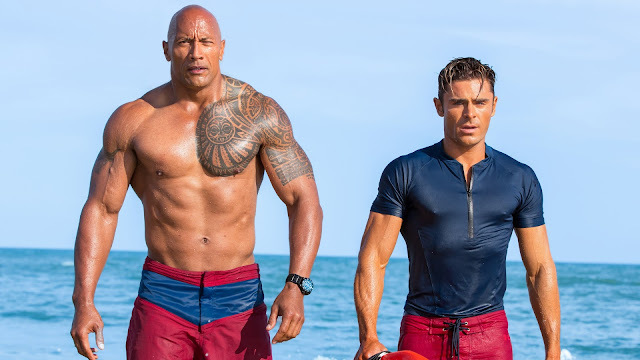 Whilst most of Baywatch sinks without a trace, praise should go to Efron's physique which is fully exploited, and the film's respectable female cast: Priyanka Chopra, Alexandra Daddario, and Kelly Rohrbach. Baywatch isn't the worst comedy of recent years, but you would have more of a laugh watching Baywatch Nights than this.